We musicians are really absent-minded sometimes and messy in the others. Although I refuse to make any drums or percussion recordings without turning the metronome (or the audio click) on, when we start to share projects between different studios/producers, there often appears "free" recordings without any tight tempo feel. Actually many experienced (and traditional) producers would say: "metronome kills the human feel in music", and they could refuse to quantize any recordings after the session. Probably a jazz drum player would refuse to play with the metronome on anyway. What we are going to do now, will be adjusting the tempo/metronome of the project, to our brilliant drum player this time. We can leave punishing him/her to a different post. Ok, we have a drum/percussion track in our hands which seems to be untight, and gets out of sync as it improves or the musician makes really groovy stuff throughout the recording... maybe the drum player is in sync with something we don't know, or he/she is being creative. How to work with a metronome-free untight drum/percussion recording? I've found a real "free" recording for the tutorial: It is Bohemian Rhapsody by Queen. Some time signature changes, and obviously, metronome or a click track was not used during the recording. "... carry on, carry on, nothing really matters..."
First things first... make sure you know the time signature of the recording. Count how many hits 'n beats in 1 measure. When we used to work with tape recorders, it wasn't possible to see the wave forms, now it should be even easier to do it. The part I will examine is from where the band gets really "excited" (4:07). 2- Zoom in the main arrangement window, turn the Snap off (if on), and move the 1st downbeat to the grid (start position) you want (In the figure, that is the beginning of the 3rd measure). so I did not set the first transient as the first downbeat. 3- Open the recording in the Sample Editor, deselect Hitpoint mode (if selected) and choose the Time Warp tool. 4- Press "Shift" key on your computer keyboard, the cursor will turn into a pencil (whoa) and click in the event at the position of the first downbeat. You've just added a "tempo event" at the first downbeat - it will lock it to that place, so we won't be able to move it accidentally. 5- Now, locate the start of the next bar in the ruler. Put the cursor somewhere close to the grid line (at the beginning of the 4th measure below), so that you'll see a small metronome symbol on the screen. 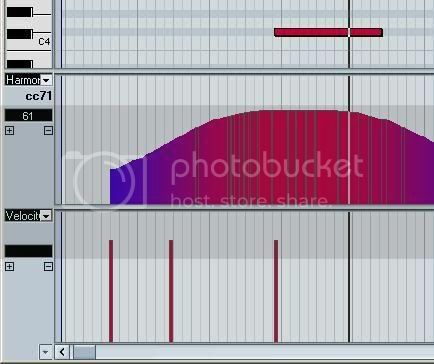 Click at that position and drag the position to the downbeat of the second bar of the recording. Don't forget, we are moving the grids, not the audio! When you click, the pointer will snap to the ruler grid. Now the tempo value is changed with the moved grid. First measure seems to be pretty tight now, as you can see below, 16th note grids and transients in the wave form of the recording are nicely aligned together. Well, Roger Taylor was playing live, together with the rest of the band ("omg" goes here) and probably he wouldn't care less about the metronome. If I were him, I wouldn't care at all. 1st and 2nd measure seems to be fine, but not the 3rd. Well, he can't change the tempo that often, can he? As you can see below, the original tempo/metronome data that we have started with comes in act, and changes the sweet tempo we've figured abruptly. It is still there at 120 bpm (default tempo of Cubase/Nuendo project templates). What we're going to do is, selecting the node which disturbs the steady rhythm and delete it from the tempo track, so the last node before can do its job. Now it should more or less be fine, but as long as drum player changes the tempo, you'll have to make subtle changes as described in the steps 1-5. As you can see it from the transport bar above, the machine follows the drummer, so that you can relax and have your MIDIs or other recordings built on the drum track! Have any questions? Any other functions that you want to grasp? Have your say via comments then! You have a loop or some beats, but you want to know the tempo of them in BPM (beats per minute)? That is very easy to calculate in Cubase/Nuendo. 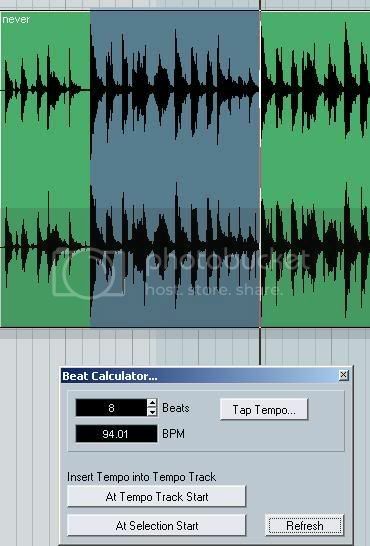 1- Import the audio into the project window that you want to calculate the tempo of (File > Import > Audio File). and in order to make a precise calculation, zoom in to the beginning of the audio (preferably to the beginning of a measure) and put the cursor to the place where you can see big transient jumps) with a mouse click. Then drag the mouse to the end of the measure. If the beginning and end points of the measure are obvious (they are, when percussive instruments involved), the calculation will be pretty much precise. 3- Count how many beats there are in the selected region (by listening :). More beats are chosen, more precise the calculation will be. I say choose 2 measures/turns for this example. You'll see the calculated BPM tempo of the audio material. With every new selection you do, just click "Refresh" without leaving the menu. 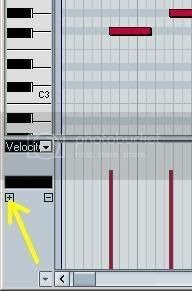 If you want to apply the tempo of the audio material to your project, click Insert Tempo into Tempo Track options. 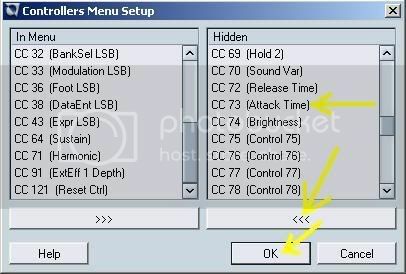 While the option "At Tempo Track Start" will put this calculated BPM information to the beginning of Tempo Track (The beginning of the project), the downmost button "At Selection Start" will put it to the beginning of the Range Selection. The tempo track and all info stamped to it will remain untill the point where the Range Selection starts. Have any questions? Any other functions that you want to understand or learn? Ok, we know how to automate VSTi and other audio tracks in Cubase/Nuendo, right? What about "automating" any kind of VSTi or outboard MIDI instrument/hardware via MIDI CC Controllers? (Actually it is not an "automation", it is just a MIDI change/controller message, just like the pitch bend). I'll show you the way. And there's no "trick" about it, all is written in manuals. In this example, I'll use MIDI CC Controller Lanes in Nuendo to control a parameter in Spectrasonics Trilogy Bass Module. PDF manual for Spectrasonics' Trilogy is a kind of mystery to me - I don't know why they still haven't put a manual for download (Do they have the manual? hehe). "The Trilogy usersguide with be here soon. Check back often". I think the last time I checked it was 4 years ago, maybe I should have checked it more often? Nah, I feel lucky their web site is still online. I want to automate "any" parameter of Trilogy. Because they can't be automated as of the date of posting (Version 1.2.4) from Trilogy UI (user interface), using "Write/Read Automation" function of Nuendo/Cubase. Here is a quick look at the manual, page 36. But probably if the parameter is not in the chart (like: "Master Filter" fader), it's not going to work. Choose the CC number that you want to control. If the CC you want to control is in this list, jump to the step #8. In this menu, the ones appearing on the right box are the hidden controllers. To make them appear in the list (step #6), you need to transfer 'em to the left. Then click "OK"
Now, the parameter (whatever you've chosen from the CC Chart, and implemented into the new control lane) will follow this lane & data. Every major function which applies to MIDI notes, applies to these lanes too. Means: you can snap them on to the grids, change the quantize values to make them less often, move them etc. But the most important thing to know about such CC Controller data is, the change you want to apply should usually come just before the notes. Controllers like modulation should be placed 1/32 or 1/64 quantize value before the MIDI notes, or else you won't hear the change, right when you wanted. Update, August 2008: I am just informed that Spectrasonics has posted some information on the very same subjcet. Well, a fella in a music production web forum (muziktek.net) started this subject about one of the tracks Timbaland produced. The track is "Throw It On Me" and released in Nelly Furtado's album. I really wonder if anyone paid royalties. Can we consider this as a "sampling" too? If yes, where's/what's the border? Hi there, this is İlter. I started to compose, arrange, record and mix music in the early 90s. After working for different studios and media companies, I started to work as a music producer, freelance musician and mixing engineer. The content you see in this blog can not be copied or used unless proper credits and links are given.